News from Bradford Marine Yacht Sales that Carlos Navarro has listed for sale the 24.38 metre motor yacht Capricho. Built in aluminium by US yard Burger to a design by Jack Hargrave, she was delivered in 1987 and refitted in 2011. Her aft deck is unusually spacious with generous seating, a full wet bar, fridge and ice maker, and it can be fully enclosed and air conditioned. Accommodation for six guests is below decks and consists of a master suite with a king size bed, a VIP stateroom and a double, all with en suite bathroom facilities. The main saloon is elegantly panelled in burl mahogany and has comfortable custom furniture for relaxation in front of the large flat screen television screen. Outside, the flybridge is made for partying with a wet bar, fridge, barbecue and a Bimini top. 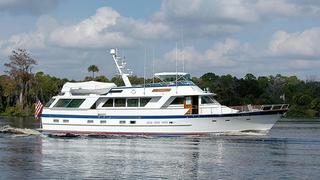 Lying in Fort Lauderdale, Florida, Capricho is asking $990,000.